Click image to enlarge Brush Prairie General Store, Brush Prairie, Washington. Image taken August 3, 2018. Brush Prairie is a small Washington community located north of Vancouver. Two and 1/2 miles east lies Hockinson, six miles north lies Battle Ground, and five miles south lie the communities of Orchards and Sifton. Brush Prairie is located in T3N R2E, Sec.22. 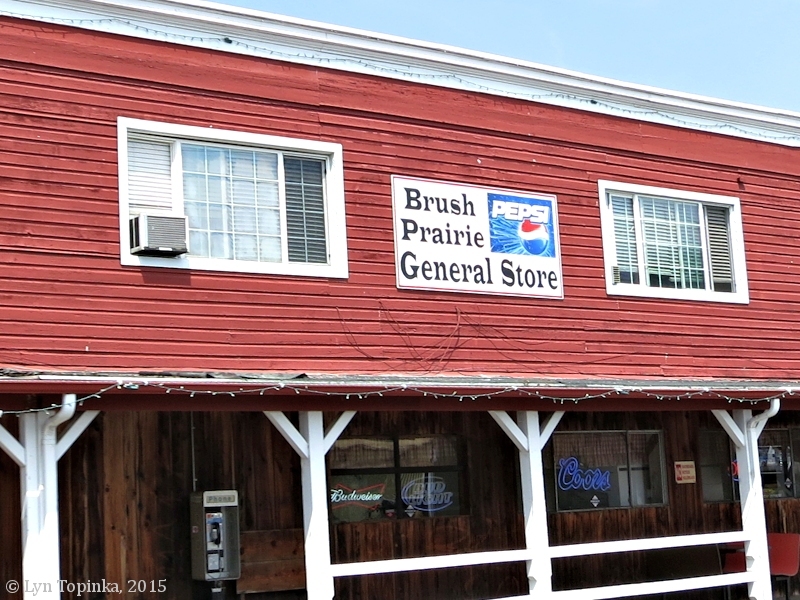 "Brush Prairie: Town 8 miles northeast of Vancouver, central Clark County. t was named by Elmorine Bowman for a very brushy prairie and swamp on her father's homestead. Several attempts to change the name have been voted down." "Brush Prairie: South of Battle Ground, this area was named by Elmorine Bowman for a very brushy prairie and swamp on her father's homestead. Others believe the area was simply named for a brushy marsh nearby."